120V systems: Up to 150 sq. ft coverage per thermostat. 240V systems: Up to 300 sq. ft coverage per thermostat. Adhesive backing of the mats makes installation a snap. Single 10ft armored cold lead means no extra wires to run. 12W per sq. ft output. Heating cable is pre-spaced at 3” and is only ~1/8” thick. All mats are 20” wide. All thermostats and HeatTech mats are UL listed for USA. Ideal for: Bathrooms, Kitchens, Showers, Mud Rooms, etc. – new construction and renovation. Works with: Tile, Stone, Granite, Vinyl, Laminate, Engineered Wood Floors and others. Tutorials: How to size floor heating mats. | Electric radiant heating mat installation techniques. X HeatTech electric radiant floor heating mats offer an affordable, easy and straightforward floor heating solution for nearly all flooring type. constant re-stapling. HeatTech mats do not bulge out unlike similar products on the market. With only palm pressure, HeatTech radiant floor heating mats can be attached to a clean and smooth flooring surface and with little effort, can be detached and repositioned if needed. This feature not only saves time, but also significantly simplifies the overall installation process. (1) 120V specified size floor heating mat. Browse a wide range of HeatTech 120V electric floor heating mats below. Multiple mats can be combined to heat areas of up to 150 square feet per single floor sensing thermostat. Each mat comes with a detailed installation manual. (1) 240V specified size floor heating mat. HeatTech 240V electric floor heating mats come in a variety of sizes and multiple mats can be combined to heat floor sizes up to 300 sq. ft. Each mat includes a detailed installation manual. Floor sensing thermostats and floor sensors listed below are fully compatible with both HeatTech mats and cable. When space calculations are complete, the size of the heated area in sq. ft is used to select a proper size heating mat as listed above. Often, the sq. ft number does not precisely match the mat size and it may be necessary to use (2) or more mats to cover the entire area. NOTE: For 120V systems, the total combination of HeatTech electric radiant floor heating mats selected must not exceed 150 sq. ft per 15A thermostat. 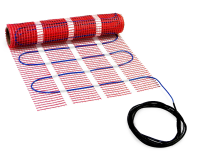 For 240V systems, radiant heating mats allow for a maximum of 300 sq. ft coverage per single 15A thermostat. When space calculations yield 57 sq. ft, a mat with 50 sq. ft coverage may be insufficient, and a floor heating mat with 60 sq. ft coverage may be too big and leave excess heating cable. As a typical solution, a combination of (2) radiant floor heating mats cane be used: (1) with 15 sq. ft coverage and (1) with 50 sq. ft coverage, totaling 55 sq. ft coverage – an optimal solution for the example provided. An area with a total of 126 sq. ft will require a combination of several mats, as the largest radiant heating mat covers only 100 sq ft. Properly selected mat sizes will be (1) 15 sq. ft mat and a combination of any (2) mats totaling 110 sq. ft of coverage, i.e. 60+50, 70+40, 80+30, etc. – whichever works best for the specifics of the given project. Contrary to the Example 1, areas such as 83, 44 & 61 sq ft most often will not require the use of a 15 sq ft mat to leverage the extra 1-4 sq. ft of space. 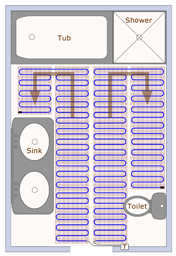 Considering the offset (spacing) of the heating mats from the perimeter borders (cabinets, walls, tubs, toilets, showers, etc. ), it is often possible to use a single mat for the entire project. It’s Honeywell – all thermostats we sell are genuine Honeywell/Aube brand, which is the #1 industry standard for quality, safety and reliability. Programmability – selecting a programmable thermostat gives user ability to control the operating time and temperature of the system. Typical savings vs. non-programmable thermostat can be in the 10-30% range. Floor sensing ability – most thermostats are designed for sensing the temperature of the surrounding air, and if used in conjunction with an electric floor heating system, will delay system response, resulting in longer system start-ups and cool-downs. Floor sensing thermostats include the option of connecting a floor sensor (included with all thermostats we sell) and provide instant and accurate temperature readings resulting in higher levels of comfort. Built-in 5mA GFCI – this safety feature is highly recommended for installation in wet areas, especially showers, kitchens and saunas and offers added protection against the unlikely event of electrical shock as a result of damaged electrical cable. Honeywell floor sensors are designed to last for the lifetime of the electric floor heating system and outperform any other known brand. The unlikely event of sensor failure may disrupt the normal operation of the system, or cause it to malfunction. For this reason, installation of a backup sensor if highly recommended to avoid disassembly of flooring and consequent repairs. Alternatively, installers may choose to use conduit piping as housing for the floor sensor, giving the flexibility to replace it without removing the finished flooring.